Here’s a great way to get the kids involved in special family traditions and have a fun Hanukkah dessert for your table. Preheat oven to 350°F. Place cake mix, dry pudding mix, milk and eggs in large bowl. Beat with electric mixer on medium speed 2 minutes or until well blended. Stir in chocolate chunks. Spoon batter evenly into 24 paper- or foil-lined medium muffin cups, filling each cup about 2/3 full. Bake 20 to 25 minutes or until toothpick inserted into centers comes out clean. Cool 10 minutes; remove from pans. Cool completely on wire racks. Spread tops of cupcakes with frosting. 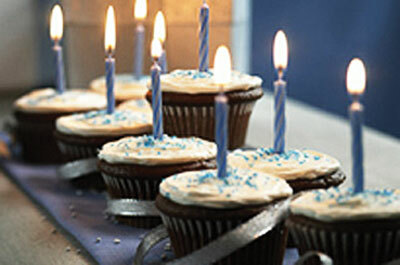 Insert blue candles into tops of 9 of the cupcakes. Arrange in the shape of a menorah, elevating the center cupcake for the shammus of the menorah. Visit www.kraftfoods.com for more fun, neat & yummy recipes!